In this post we will discuss about how we can enable breadcrumb in SharePoint 2013 sites. 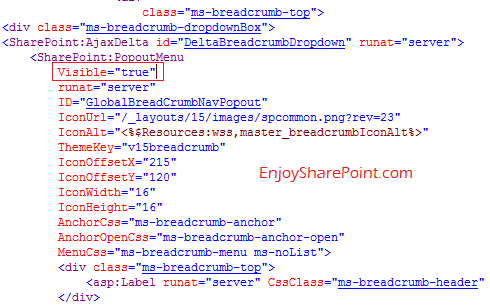 By default breadcrumb is disabled in SharePoint 2013 sites. We can enable the breadcrumb by doing some minor changes in the SharePoint 2013 master pages as well as we can add the classic SharePoint 2010 breadcrumb in our SharePoint 2013 site. In SharePoint 2013 they have not removed the breadcrumb, they just hide it in the master page. To make it available Open your master page in SharePoint 2013 designer. Then you can see the below tag. To implement the classic breadcrumb like SharePoint 2010, You can just use the below tag where ever you want in the master page. If you want your list or libraries to appear here in breadcrumb then you can use the below option. Here in all these options, the changes is in the SiteMapProviders option.